-Assessment: a team of professionals begins by assessing the project and providing an estimate. Different types of flooring can cause the time and expense of any given project to vary, but generally, a commercial or residential project can take as little as 24 hours to complete- without all the cleanup afterward. -Property Protection: Although a dust-free tile removal process eliminates most of the risk of a messy clean-up and damage, we take a few extra steps to make the project as stress-free as possible. All of the furniture and surrounding surfaces in the room are covered in a protective plastic material to further reduce the risk of damage or messiness. -Removal: At this step, industrial jackhammers are used to demolish the original flooring. However, unlike with a traditional process, a vacuum is attached to the point of the contact of the jackhammer. The result is that every particle of dust is immediately sucked out of the environment and removed before it ever has a chance to reach the air- and the client’s property and breathing space. This is what eliminates the mess, the need for clean-up, and the health hazards posed by dust particles. Every square foot of tile can produce up to a pound of dust, but with this process, it’s all taken care of before it impacts the surrounding environment. -Grinding/Finishing: Once the tile is removed, the remaining surface and thin-set are ground down and finished to create a smooth, even surface that is ready for a new flooring installation. During this time, dust and debris are also removed through vacuums as well as manual labor. -Cleanup/Hauling/Removal: Although the exclusive vacuum technology used in this type of tile removal process eliminates most of the dust, with any construction project, there are always materials to be cleaned up and removed afterward. This is where Dustbusters also differs from the competition. We provide our own dumpsters and take care of every aspect of the clean-up and removal of the byproducts of the process. This eliminates dumping and hauling fees as well as time-consuming cleaning- ultimately, it saves you money that can be spent on a brand new floor, or whatever other project you want to invest in! -It eliminates the health hazards caused by dust, including a higher risk of COPD, emphysema, cancer, asthmatic attacks, and scarring of the lungs. -It relieves some of the stress caused by a big project. Whether residential or commercial, floor removal can be time-consuming. Without having to worry about health risks, damage, or cleaning up, some of this stress is taken off the client’s shoulders. -It’s less disruptive to the client. Traditionally, businesses and private homes have to be vacated for floor removal due to the health hazards associated with dust. With dust-free floor tile removal, families can stay in their homes and businesses can keep operating, resulting in less upheaval for everyone. 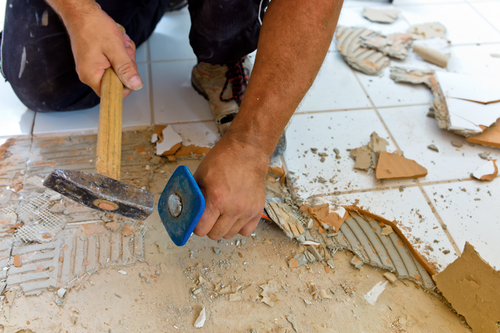 If you’re interested in a professional, less expensive, and higher quality floor tile removal process, call Dustbusters today at 866-883-8783.